The new season arrived and you must be wondering about how to transition your old wardrobe pieces to the new one, since the weather is unpredictable. For both current seasons - I mean, spring and autumn - you can create the best transitional looks, if you adapt it to your needs. There are many ways to make your outfit looking stylish: investing in layers; adding prints and colors; playing with accessories and more. In my opinion, the folk style is a perfect choice for this moment and my choice of the day. Today's outfit was inspired in a way to adapt to both seasons, mixing textures and adding charm! 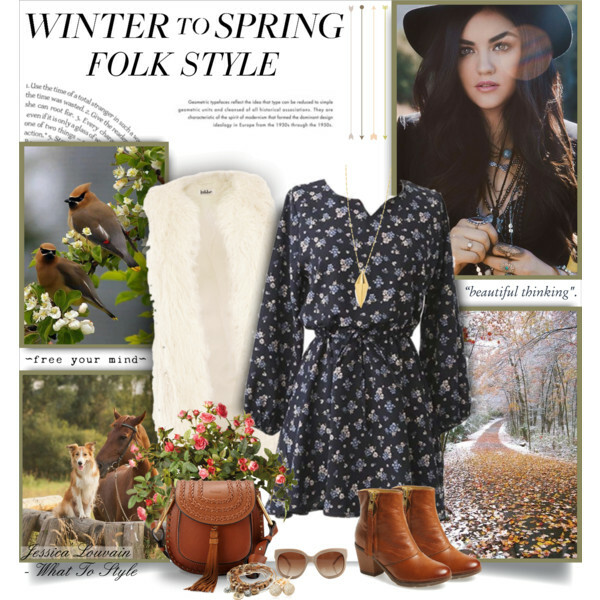 You'll need: a faux fur vest (yes, it's not a real fur); floral print dress with long sleeves; ankle boots; a boho inspired bag; long necklace; stud earrings; wrap bracelet with charms and sunglasses! How are you transitioning your wardrobe pieces to the new season? A nova estação chegou e você deve estar se perguntando em como fazer a transição de suas peças antigas para a nova, já que o tempo é imprevisível. Para ambas as estações atuais - quero dizer, primavera e outono - você pode criar os melhores visuais de transição, é só você adaptá-lo às suas necessidades. Há várias maneiras de deixar o seu look estiloso: investindo em camadas; acrescentando estampas e cores; brincando com acessórios e muito mais. Na minha opinião, o estilo folk é uma escolha perfeita para este momento e minha escolha do dia. O look de hoje foi inspirado de maneira que atenda ambas as estações, misturando texturas e adicionando charme! Você vai precisar de: um colete de pele falso; vestido estampado floral com mangas compridas; botinhas ankle; bolsa com toque boho; colar longo; brincos pequenos; pulseira com pingentes e óculos de sol! Como você está fazendo a transição de suas peças do guarda-roupa para a nova estação? That is so pretty I love that Dress, perfect for the sunnier seasons. Such a chic outfit. I love the bag! That dress is so pretty and I love the idea of it paired with that pretty white faux fur vest and those cognac booties, perfect for spring! Thanks so much for sharing and I hope you're having a great day so far! I love these pieces :) That dress is so pretty! That floral print dress is gorgeous! Great style darling. The boho dress with the white vest look nice together. Love the styling, pretty dress! I love the cinched in waist on dress and that necklace is really pretty! Adoro o estilo folk, acho muito lindo! Love playing with accessories when it's transition time. Great outfit! I just followed you on IG. Please follow me back @FashionRadi. Stay in touch! love the whole outfit especially the dress xo! I'm loving the boho/loads of floral prints this season! Well, I love floral for all seasons, but especially right now. Great choices!! Dying over the chloe bag! So gorgeous! Amazing outfit choice. Floral dress print is so gorgeous..
Love the dress! Great set! Absolutely love that outfit combination, the dress is such a stunning feature too! love the boho vibes in this! great outfit. Beautiful post, I'm in love for the colours and for the vest! Totally loved this. Happy Friday, Jessica. I'm so in love with this. I love this style. The vest is perfect. Dress, boots and bag are fantastic!!! This time of year is quite difficult to dress for with weather changing constantly. I really like your set. It's perfect for spring. I absolutely love the look that you put together here, it's very boho chic! Agarrei amor nesse look. Tanto pelo vestido quanto pela bota. Mandei as perguntas a você ok? Ahh I love this set you put together for the transition to Spring! The ankle boots are one of my favorites!! Love the look! Would be perfect for the music festival season! Absolutely amazing combination! I love it! Have a nice week ahead! Aw loving that whole look! I really like your blog, let me know if you would like to follow each other! I agree, layers really are key for this time of year! eu acho lindo esse estilo! confesso que não tenho peças folk no meu armário mas é uma das peças que quero começar a investir pro outono/inverno! The dress you've chosen for this fashion set is perfect for the style theme and I adore the Chloe bag!